By joining these groups you will improve your social confidence whilst enjoying getting creative at the same time. 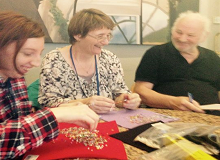 Our friendly arts and crafts groups are there to encourage participation in a range of creative activities in a relaxed and peaceful atmosphere. Whether you fancy book folding, toy making, yarn dolls, painting, pot decorating, we are sure to have something you are interested in. We are open to your suggestions and our programme evolves around your interests and needs so even if you feel you have no talent, it is the taking part that counts, so come along and have a go! As with all our activities, if you need some extra support to attend, we can arrange for someone to meet you before the group so you don’t have to walk in alone. Alternatively if you want to ring up and talk to someone so that you know what to expect on the day, then that’s fine too. We are here for you, however you feel so just let us know what you require. 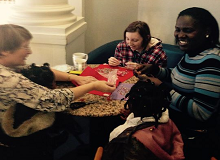 Click on the link below to read about our art group. Click on the marker below for more details.